Allison Partners was established in 2000 to deliver professional coaching and organizational development services to clients in the private, public and non-profit sectors. Conceived and founded by Allison Linney as the result of a business school project, the formation of Allison Partners marked the realization of her vision to establish a company dedicated to providing high-value consulting that enables individuals and organizations to achieve their potential. With the counsel of faculty, colleagues and business advisors, Allison established a new consulting practice with an initial focus on a small group of core clients. As Allison Partners has grown in the past sixteen years, the firm maintains its clear focus on human performance at both individual and organizational levels. Allison Partners strives to operate in a manner consistent with the advice given to clients, ensuring that consultants and team members “practice what is preached” and have practical, first-hand understanding of the challenges inherent in sustaining a high-performance organization. Today, Allison Partners serves individual and organizational clients throughout Virginia and around the United States. 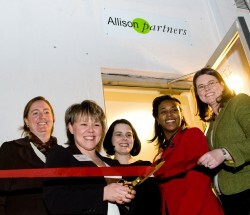 Team members Mary Sherman, Allison Linney, Jennifer Nunnally-Hux, Natalie Brown and Rachel Brozenske celebrate the grand opening of Allison Partners’ Charlottesville office in January 2009.